I have last minute email entries from our wonderful email friends! "Here are two cards by Maureen. She used an ivy stamp by Art Impression and Sand/Snow by Stampendous. She drew in the rock. 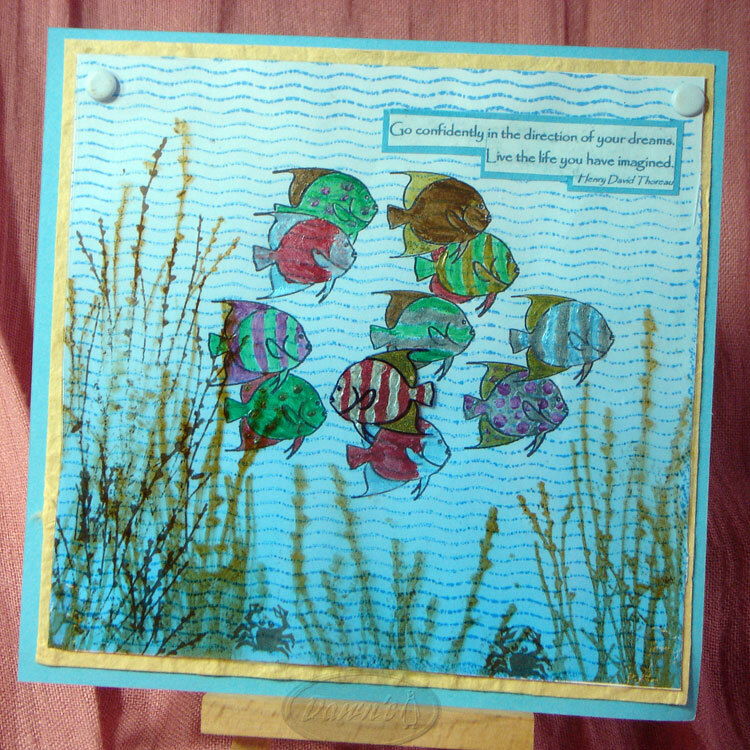 Maureen stamped her design on blue distressed scrapbook paper. She stamped the fish by Beeswax onto white paper and cut them out. All other images on both cards are stickers." "Another last-minute entry from Huddersfield! When I first saw this month's challenge, I thought I couldn't take part as I didn't think I had any appropriate stamps. But then I was looking through our collection and came across a set of Fiskars animal stamps which we've hardly used - and, lo and behold! it included several fish stamps and a set of crabs! 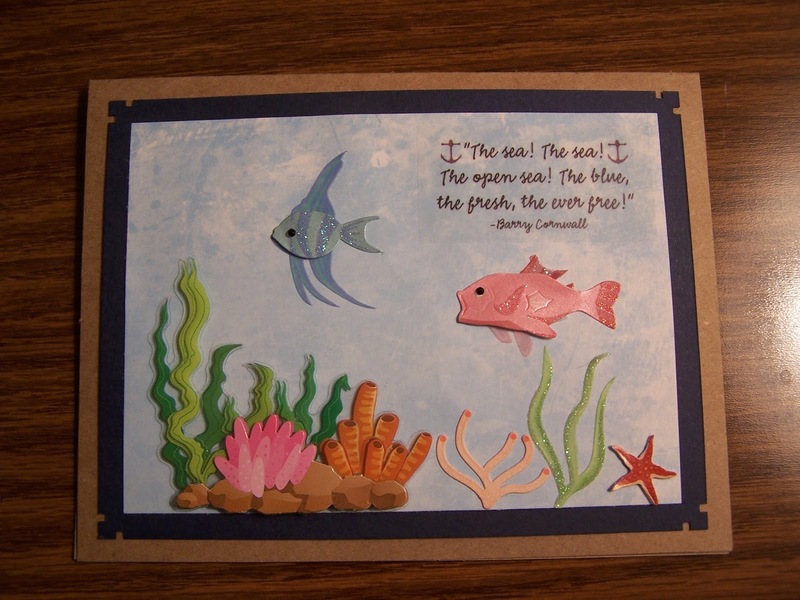 So I decided to make a scene with a shoal of fish, using just one stamp repeatedly, masking to add depth. I wanted to have one fish swimming against the tide - I was thinking it should be an encouragement of individuality, saying "don't just follow the crowd, be your own person, chart your own course ..." and, after much searching, I found this Henry David Thoreau quote which I thought suited - "Go confidently in the direction of your dreams. Live the life you have imagined"
So, having stamped my shoal of fish, how to get one swimming in the opposite direction? 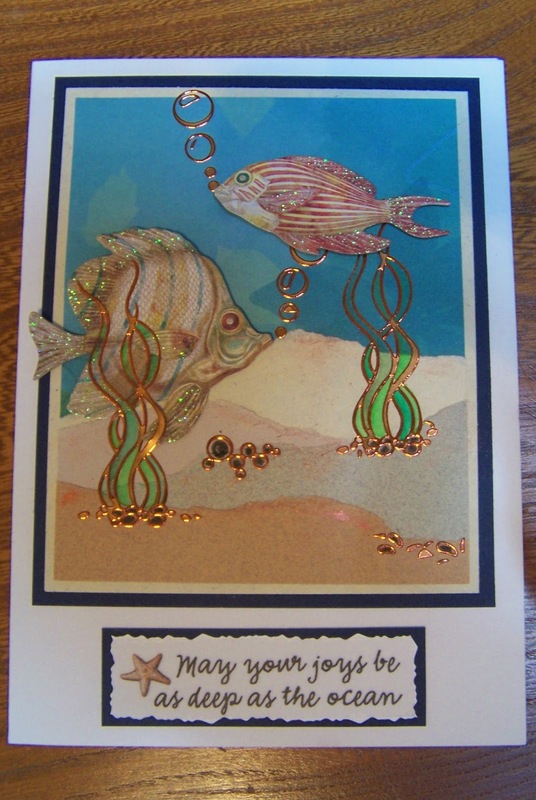 Well, I took some blue-tinted acetate and stamped on there, colouring the fish using Liquid Pearls. Once dry, I was able to reverse the image by placing the stamped side of the acetate down against the paper on which I'd stamped and coloured all the other fish. I don't have any seaweed stamps, so I used the "willow twigs" from Inkylicious - mostly, these are stamped on the reverse side of the acetate but, as I was putting the whole card together, I realised that there was a big empty space at the left-hand side, so I stamped some more "seaweed" onto the paper, because I'd already attached the acetate with brads and it was too difficult to get the stamp in position on the reverse of the acetate!" 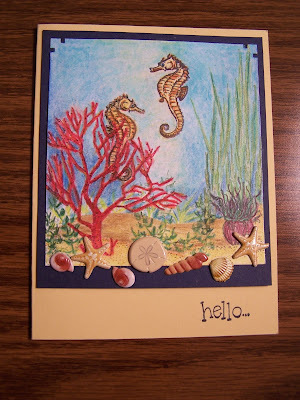 "My first card uses a sea horse by Beeswax. 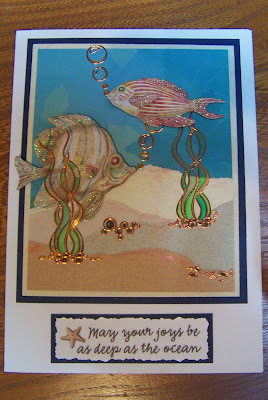 I stamped it once, then used transparency paper to create the mirror image. 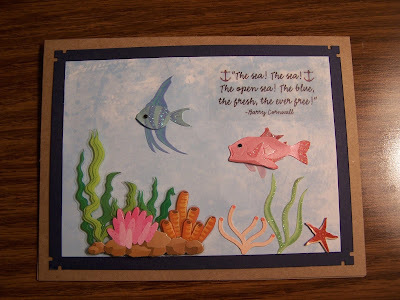 The ocean floor is Sand/Snow by Stampendous. I wanted to see how many plants I could transform into sea weeds... The coral reef is part of a large branch by Beeswax, the purple, hairy sea anemones in the right hand corner are the roots and bulbs of daffodills! All other sea weeds are leaves, grasses and flowers by Art Impressions. The second card is torn paper and stickers - no stamps at all." Wow! Three great cards from folks who do not have a blogs! I will be back on Sunday with a winner and the top 3 picks. you made such a beautiful cards with this theme. beautiful done with that stickers images to make a scene. you can see that you don't have use a lots of stamps to make a scene. beautiful card have you made! 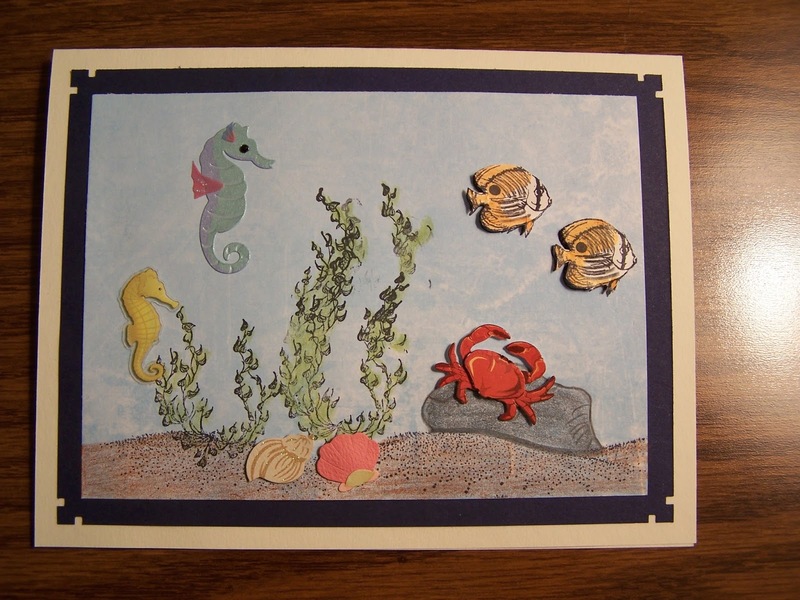 fantastic cards have you made. beautiful scene on your first card. the second card I find the different sand colour beautiful to see.